Each Excel dialog box that you create in VBA is stored in its own UserForm object — one dialog box per UserForm. 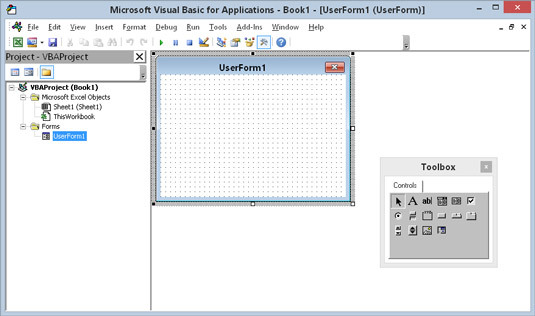 You create and access these UserForms in the Visual Basic Editor. Activate the VBE by pressing Alt+F11. Select the workbook that will hold the UserForm in the Project window. 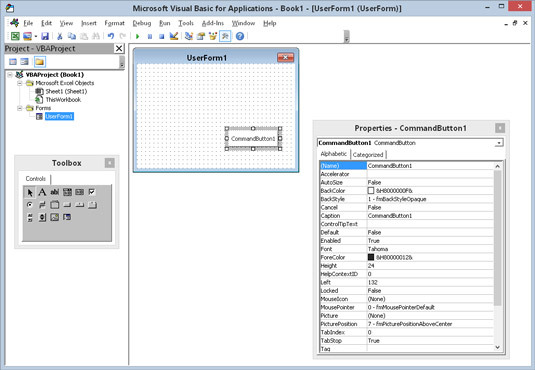 The VBE inserts a new UserForm object, which contains an empty dialog box. Here is a UserForm — an empty dialog box. Your job, if you choose to accept it, is to add some controls to this UserForm. When you activate a UserForm, the VBE displays the Toolbox in a floating window. You use the tools in the Toolbox to add controls to your UserForm. If, for some reason, the Toolbox doesn’t appear when you activate your UserForm, choose View → Toolbox. To add a control, just click the desired control in the Toolbox and drag it into the dialog box to create the control. After you add a control, you can move and resize it by using standard techniques. Here is a list of the various tools, as well as their capabilities. Every control you add to a UserForm has properties that determine how the control looks or behaves. In addition, the UserForm itself has its own set of properties. You can change these properties with the aptly named Properties window. This shows the Properties window when a CommandButton control is selected. Use the Properties windows to change the properties of UserForm controls. The Properties window appears when you press F4, and the properties shown in this window depend on what is selected. If you select a different control, the properties change to those appropriate for that control. To hide the Properties window and get it out of the way, click the Close button in its title bar. Pressing F4 always brings it back when you need it. Make sure that the correct control is selected in the UserForm. Make sure the Properties window is visible. In the Properties window, click the property that you want to change. Make the change in the right portion of the Properties window. If you select the UserForm itself (not a control on the UserForm), you can use the Properties window to adjust UserForm properties. Every UserForm object has a Code module that holds the VBA code (the event-handler procedures) that is executed when the user works with the dialog box. To view the Code module, press F7. The Code window is empty until you add some procedures. Press Shift+F7 to return to the dialog box. Here’s another way to switch between the Code window and the UserForm display: Use the View Code and View Object buttons in the Project window’s title bar. Or right-click the UserForm and choose View Code. If you’re viewing code, double-click the UserForm name in the Project window to return to the UserForm. You display a UserForm by using the UserForm’s Show method in a VBA procedure. The macro that displays the dialog box must be in a VBA module — not in the Code window for the UserForm. When Excel displays the dialog box, the ShowDialogBox macro halts until the user closes the dialog box. Then VBA executes any remaining statements in the procedure. Most of the time, you won’t have any more code in the procedure. As you later see, you put your event-handler procedures in the Code window for the UserForm. These procedures kick in when the user works with the controls on the UserForm. It’s usually a good idea to change the default name the VBE has given to your controls to something more meaningful.